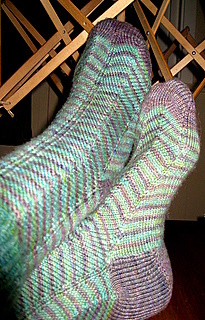 The yarn is what was left from my Jaywalkers and has been designated for this pattern for quite a while, the toe-up leaves seemed perfect for using up the last bit of this colourway. I don’t often pay much attention to names of knit designs, and it wasn’t undil I googled ‘Vinnland’ without adding ‘socks’ I realized it was the English word for Vinland (yeah there should have been some bells ringing). The left sock is actually inside out in the top two pictures. I like both sides of the pattern! About a thousand years ago the Vikings were racing around in Northern waters traveling far east into Russia, south to Jerusalem and west to Vinland. Such a journey did reqire its pitstops though, and the first leg was made by stray sailors stumbling across what was soon, and very understandably, named Iceland. 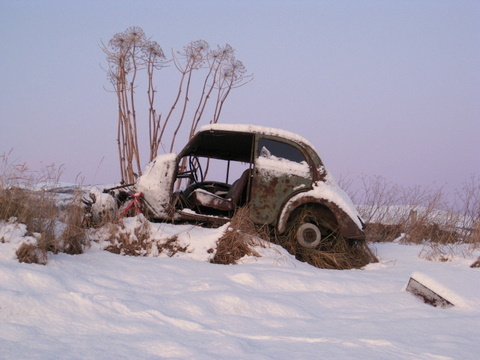 This place was soon colonized but it didn’t stop the curiosity and eagerness, and need, to travel. After being outlawed for a murder, Erik the Red set sails westwards and returned with reports of more land, deliberately named Greenland to rise interest. You think today’s PR people are stretching the truth?? I wonder if he was enough of a practical joker to yell BURN!! when he returned with the first settlers and saw their jaws drop at the sight of glaciers and barren coastline. 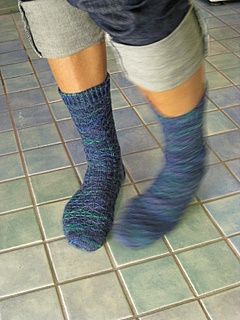 I knit four repeats of the pattern before the heel, and four for the leg, that made a perfect sock. 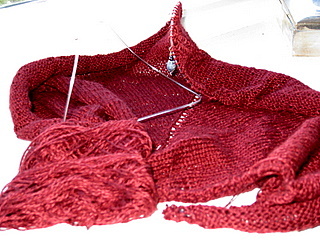 The pattern is so stretchy that gusset increases which I usually can’t live without, is unecessary. 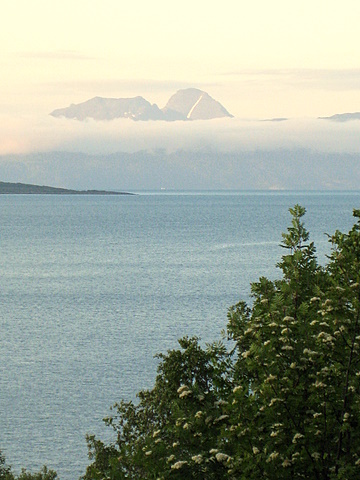 Apparently his son Leiv Eiriksson did’t share his dad’s sense of humour, but he did repeat him in sailing towards unconfirmed discoveries of land in the west, reaching Labrador and Baffin Island and what he named Vinnland. The location of Vinnland is not known, but the word translates into either ‘land where wine grapes grow’ or ‘pasture land’. Wether he had more luck with his discoveries then his father, or just realized that a little PR couldn’t harm is unknown. Archaeological findings including drop spindles and what Wikipedia refers to as a knitting needle confirms Norse settlements in North America 1000 years ago. I guess they refer to a nalbinding/needlebinding needle, as knitting wasn’t known back then in those cultures and only took over for needlebinding very few centuries ago. 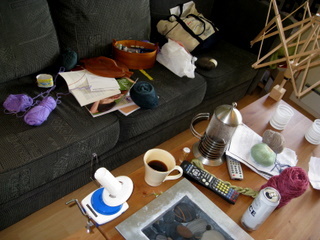 In fact, in many Norwegian dialects including my own, to knit is also referred to as to bind, and I call my work in progress my ‘bunding’ or binding. Fast forward about 500 years to our friend Chris who thought the world was a ball and set sails for India. Little did he know that there was a lot standing between him and his target. In fact a whole continent or two. He never made it to India to see the tigers. Cuff-down socks over 36 sts, 2 mm needle, picot edging and short-row heel. Opal Rainforest Tiger yarn, to fit a 6-12 month old. He did bring back some other goodies though , like chocolate!, and although the behavior of his men and the consequenses of most land discoveries can be debated, all these guys lived a life in hand-spun, hand knitted (or bound or sewn) socks. That counts for something, right? My Vinnland socks are now on their way to my aunt, hopefully bringing more reliable promises of buds and leaves than Erik the Red’s Greenland did! Yarn: A Piece of Vermont Merino/Bamboo/Nylon sock yarn, colours grey “Darkness Falls” and green “Mermaid”. Modifications: Adjusted sizing down one step. 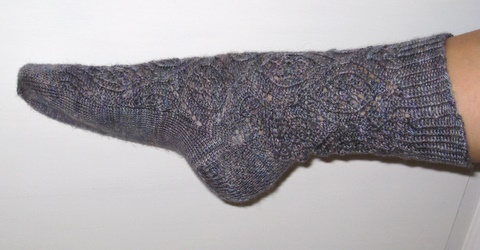 After finishing the Ironwork socks I had 40 grams left of the yarn, and I put it away on my sock yarn shelf. And took it out. And put it back. And took it out. And petted and squeezed it. And caved in and wound up another skein of the same goodness and started a pair of toe-up socks so I could use every single meter of the stuff. This is for sure my new favourite sock yarn, not splitty like other bamboo blends I have tried and a dream to knit with and to wear. These have actually been finished for quite a while, have been through the washer one or two times already and I wish I photographed them while we still had some decent light around here. Colours in the pictures are fairly accurate, and I love the tiny bit of variegation that makes the stripes more interesting. Did two rounds of grey and three rounds of green and that turned out to make a perfect length sock with the yarn I had left. This was my third pair of Jaywalkers, but first toe-up. I knit until I ran out of the grey and than started the cuff with the green, the only thing I would do differently next time is to decrease 4 or 6 sts before starting the cuff because the Jaywalker pattern creates a really dense fabric and you need fewer sts in rib to get the same circumference. So my cuffs flare a bit but hey..still love them and it is good to know there is potential for improvement, yes? 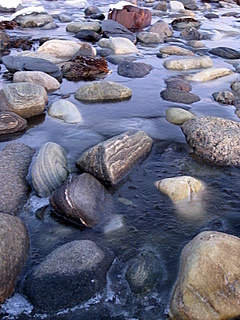 It was as cold as it looks, so handknit socks, mittens and shawls are a must for a walk along the shore. The Feather and Fan lace pattern is called Seafoam in Norwegian. 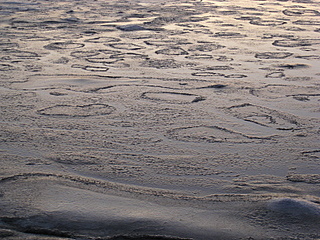 This must be why, slush ripples, frozen until the next high tide comes in. 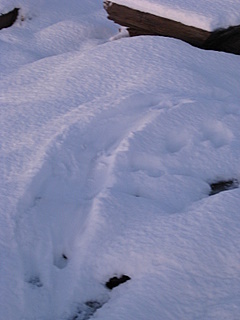 The sea otters still walk around barefoot, sliding on their bellies in the snow! Probably faster and more fun than hitching a ride. Today I’m home with a cold. 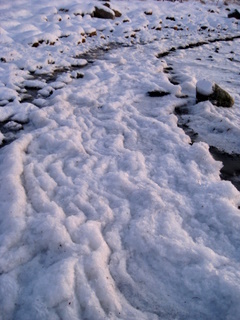 I have warm coffee and radio and outside the winter has covered the remnants of what is now over in snow. The ocean lies calm and the sky is light and the sun would have shown herself for the last time this year if the hazy clouds would have let her. I can’t tell if the clouds will bring thaw or storm. Right now the whole world is silver and quiet. 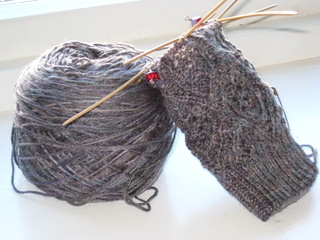 I haven’t knit a stitch on the green thrummed mittens I promised I’d finish before starting another pair of socks. I didn’t have to. Someone else knit socks for me! 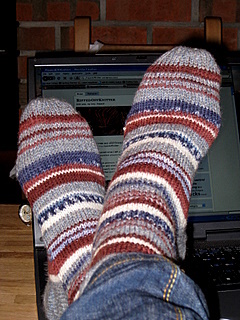 Wonderful stripey socks with a base of lovely silver gray, and other yarns combined to match it. This isn’t self-striping, each stripe is carefully placed to match the others, and the socks are knit with exactly the same stripes. I haven’t received handknit socks since Grandma’s days, and am incredibly grateful that I now have such fantastic knitterly friends! A loong while ago I received a reward from Jessie, the woman behind the wonderful hand dyed goodies from A Piece of Vermont. 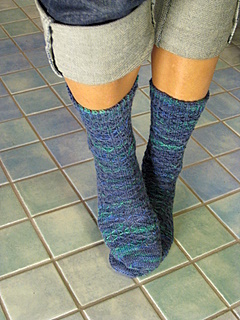 Highly recommend the bamboo sock yarn, more about that in my next post. And I’m awaiting yet another shipment any day now with yummy colourful fibres. Mm. 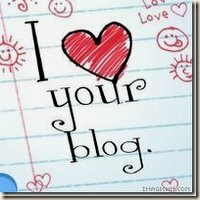 Thanks Jessie and right back at ya! Kelp knits! – but not if you’re afraid to be tempted into more gorgeous sock patterns..
Supernøtt – in Norwegian, but the gorgeous pictures should speak to all of you! Meretes monster – warning: danger of laughter-induced coffee-spills. Ahh, if everyone had your self-irony Merete! That should keep you busy a while, talk later! Beautiful pattern. Beautiful yarn. 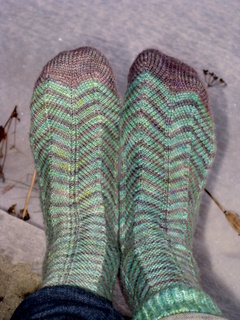 In hindsight maybe the sheen from the bamboo obscures the pattern a bit, it least it made the socks really hard to photograph. 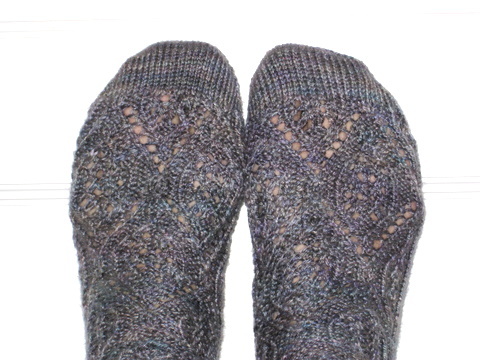 Go look at all the pretty socks on Ravelry for a better view, especially of the heel detail. I am still really, really pleased with them. And with myself, cause this is probably the hardest, or most concentration-demanding pattern I’ve knit to date. The instructions are well written and the pattern comes with separate charts for all the three sizes so once I had most of all the symbols figured out it got easier. Still, there is a lot going on in every single row. They are slightly too big for me but I hope they will fit the recipient. Cause I would probably never knit them for myself, there is simply too much work that I would have bothered. So they are knit for a very special friend of the family who once taught my mother another fiber-related craft. They have kept in touch for more than 30 years and packages keep arrriving with things like beutiful thin silk in every colour imaginable, which I think I will use held together with a thicker yarn for a shawl, or a bunch of rosewood needles for the family to share. Here is my part of the catch. Can’t wait to try the ones that are sort of straight neeedles but with a cable end like a circular. 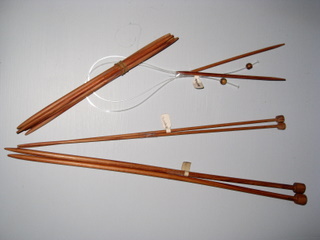 The work is then kept on the cable with a wooden bead. Never seen that before! Last time our friend visited she admired my Pomatomous socks and in spite of being a handspinner, weaver and embroidery artist she hadn’t seen knitting like that before. I can’t think of anyone I’d rather knit these for. Now I just hope they fit! 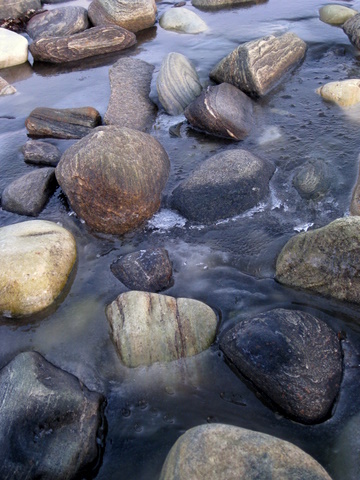 We are still waiting for summer to reach these latitudes. 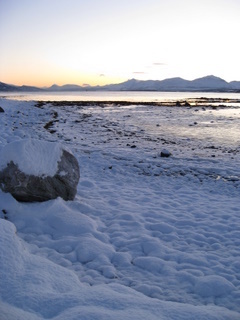 We do have the midnight sun, the green grass and all that but we haven’t had any real warmth yet. It is still pretty though. Summer up here is not green, it is more like a blue-white marble, sort of like earth seen from space. 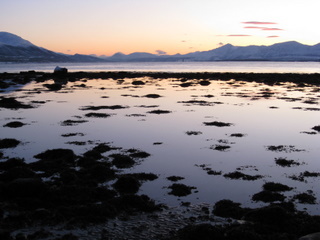 Days and nights float into each other, the ocean and the beaches look like tropic waters but certainly feel sub-arctic, and mountains seen from a distance are blue with white stripes of snow, and the dark green leaves and white flowers just complement the blue. 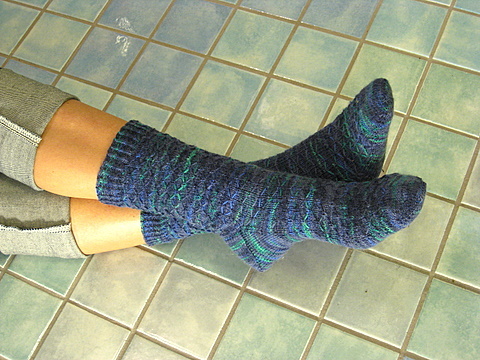 Pattern: Leyburn socks by Pepperknit. Will make these again! Modifications: Figure 8 cast-on for the toe, my favourite toe-up flap heel from Baudelaire socks and this bind-off. Did the leg over 62 sts instead of 68. I had a bit of a slow start with these but once the pattern was established I cruised through them in no time. The slipped stitches creates a really, really comfy and sturdy fabric and the fit is excellent so I see more of these in the future. The only thing I will change is the yarn, although Regia is nice to knit with and wears like iron this pattern deserves a yarn with exceptional stitch definition to show off the subtle geometry. Suggestions?